We are proud to say we have been an accredited member of The American Animal Hospital Association (AAHA) since 1970. 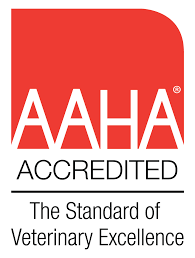 That means that as an AAHA accredited provider, we hold ourselves to a higher standard. 900 actually, that is how many standards are evaluated in our hospital by AAHA every 3 years. We are proud to be a part of the 12% of Veterinary hospitals in North America that are AAHA accredited. We are proud that you have chosen us, an AAHA accredited hospital to care for your furry family member. When it comes to Veterinary medicine, accreditation is voluntary. Only 12% of veterinary hospitals in the US and Canada are accredited. Accredited hospitals are recognized as amongst the finest in the industry. How did we become accredited? AAHA sends consultants to our practice to evaluate us on-site. We are evaluated on over 900 standards of care; everything from cleanliness to medical records to anesthesiology. This evaluation happens every three years, ensuring we are maintaining their standards, which are the highest standards in the industry. Accreditation means your furry family member is receiving the BEST care using the most advanced methods available. We choose AAHA because we believe a standard of excellence is a basic right for ALL pet owners.